Perfume bottle, untitled, 2010, holly, purpleheart, epoxy, paint, 115mm (4 1/2in) dia. 1. 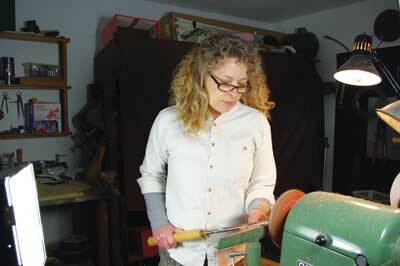 How did your background in boat building help to introduce you to woodturning? I would never have discovered woodturning if we had not built that boat. However, it is quite likely I'd have found some other art form through which I could make things. 2. Where does the inspiration for your work come from, primarily? I am very influenced by the Art Deco period - art, architecture, jewellery and clothing. I think it's the tightly designed compositions which are both simple and complex that I find so appealing. 3. The dominant theme in your work is the white and black colouration you use; what made you decide upon this particular theme? It is a very formal and elegant look which I think goes well with my theme of the Art Deco era. 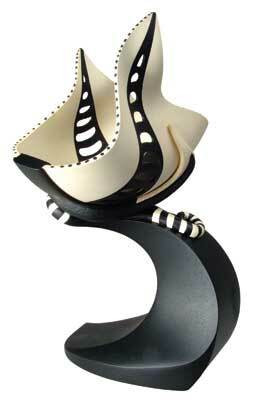 Black and white has a certain quiet decorum - an aloof quality to it - and it is very simple. 4. What is your favourite timber to work with? Holly (Ilex spp.) is my wood of choice because of its whiteness and lack of noticeable grain pattern. It makes a good background for the black graphics. 5. What are your current likes and dislikes within the sphere of turning? It's unfortunate that we identify so thoroughly with the machine that spins our wood so that other roads to wood art are excluded or overlooked. The determination to focus on pure turning can potentially be stifling to growth in this field. And I'm disappointed that wood art lags behind in terms of acceptance and therefore value. What I do like is all the great people I meet and the fun everyone has sharing their knowledge and experience. 6. What direction do you see your work taking? I see my current work morphing into other expressions - perhaps more organic. I won't abandon the split vessel forms I've developed over several years, but they will evolve and change, which is essential to staying inspired and enthusiastic. The piece I am about to work on is similar in form to the current black and white vessels but is a different wood and has a variation in the design and piercing. It is an experiment to see if this is a direction I'd like to continue. 8. If you could only offer one bit of advice to someone starting out turning, what would it be and why? Learn the craft and craftsmanship first, and experiment with the aspects you like. Allow individuality to develop by working in series, because that's the way to find your voice. 9. What music and which book are you currently into? I am currently reading Rumpole and the Angel of Death, by John Mortimer. He is among my favourite authors for his caustic wit and superb writing style. Music-wise, anything played or sung with soul; blues, folk, jazz, swing, ethnic...but no pop or rap, please. 10. 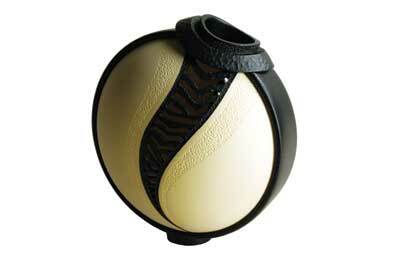 What are your hobbies and interests outside of woodturning? I always have a book. In the spring the garden calls; while we're on the boat in summer - it is more or less a floating cottage - there is canoeing, swimming and hiking; and during the winter it's cross-country skiing. I make time for these activities so that the workshop stays inviting. Besides the lathe, obviously, the bandsaw, the oscillating spindle sander and the vacuum chucking system. 12. Which turners do you most admire and why? The list is long but to name two, I'd have to say Al Stirt, for the simplicity of his forms and the mesmerising complexity of the texture. 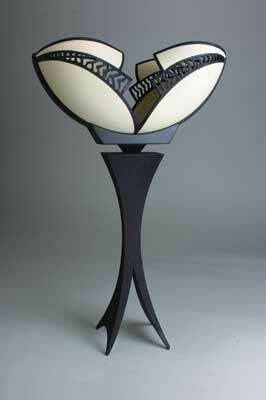 I also admire the bold, clean compositions of Stoney Lamar's wood and metal sculptures. 13. What do you think the best single development in turning has been? The loosening of the traditional bonds of grain worship and the overriding of the purist's "no tampering with the natural beauty of the wood" rule, to allow more expressive art to emerge. 14. What do you see yourself doing in five years'time? I really don't know what I see in five years, perhaps spending more time in my workshop and not travelling quite as much. I expect I will be involved in woodturning in different ways than I am at present, but I'll certainly still be involved.